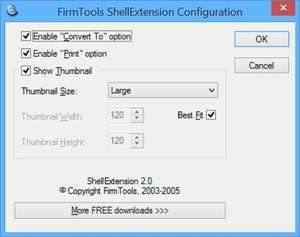 ShellExtension adds three new options to your right-click menu on a picture file: convert, print, and thumbnail preview. Converting supports most of the formats you will ever need: GIF, JPEG, BMP, PNG, and more. The thumbnail option is particularly handy when you are in a file open dialog. For security reasons, you should also check out the ShellExtension download at LO4D.com which includes virus and malware tests. Additional screenshots of this application download may be available, too.